European Championship Warsaw, Poland 17-18.04.2015 year. 2.Kristiana Laleva in juniors 55kg. Bronze medals were won by Denitza Georgieva in juniors kata, Iliyan Unakov in juniors 60kg and the young national fighter of Shumen - Ivelina Petrova in juniors 55kg. In her first match Shumen's karateka convincingly defeated the representative of the host country Drazba Marlena, in her quarterfinal she unanimously won over Babich Anna of Ukraine. After that for the semifinal bout she was unfortunately paired with the european champion Nemeth Veronika of Hungary and after a very close fight, Ivelina had to settle for the bronze. Shumen's other national fighter Dzhaner Shukri also made an honorable performance on this European championship and gained valuable experience. He fought a very difficult and contested fight in the category with the most competitors in juniors 65kg against the host representative Karpowicz Michal. In regular time our competitor had a slight advantage over his opponent, but in the tough following minutes of extra time both fighters gave everything they had and after a very equal fight the judge's decision may have been influenced by the home factor. Despite his loss our karateka showed greath growth in his game and displayed the necessary qualities for an even better showing on the international tatami. The competitors of SC "Kyokushin" Shumen were able to take part in the European championship in Shinkyokushin karate for juniors, men and women in kumite and kata thanks to the help of the Municipality of Shumen and "Bulgartrans" ltd. Shumen's karatekas continue their preparation for the upcoming tenth edition of the Traiditonal tournament for the "Madarski Konnik" cup for men and women in kumite and kata, which will take place on 25.04.2015 in "Mladost" hall. Day of Japanese culture, Shumen 07.04.2015 years. 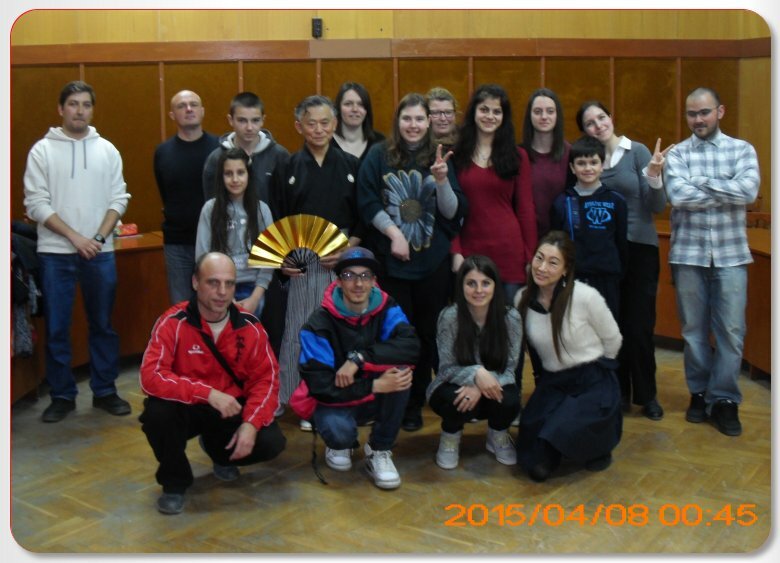 On 07.04.2015 at Shumen University "Episkop Konstantin Preslavski" took place a Day of Japanese Culture. The event was organized by Ms. Ukiko Tamamaru, a teacher in japanese language and culture for the Japanese association for international cultural exchange together with sensei Tadashi Togava and Ai Tsudzhino - teacher in Japanese at SOU "Vasil Levski" in Russe, the Center for international collaboratio nand projects for Shumen University. The event was attended by students of the class in Japanese language and culture of ShU, children of Shumen clubs in eastern martial arts and curious citizens. The Day of Japanese Culture began with a presentation on Kamishibai, led by sensei Tadashi Togava. Kamishiban has been preserved as a way to tell stories for centuries, but is most well known for its revival in 1929, when it gained great popularity. Kamishibai is heralded as the predecessor of modern manga and anime and represents a form of visual narration. It was very popular during the thirties and fourties, then it was replaced with the appearance of television, but it has recently attracted interest again in japanese libraries and schools. In the past the Kamishibai storyteller would go from village to village on his bike, equipped with a small stage. After he entered a populated area he would use two wooden rattles, called hiyoshigi, to annouce his arrival. After an audience gathered, he would perform his show with the help of illustrated panels, placed on the miniature stage - going through them with different speed, depending on the story. The tales were often set up as a series and with every visit in the village were shown the next episodes. In the second part of the presentation sensei Tadashi Togava, born in 1936, introduced everyone to Kuroda Bushi /Kuroda Song/, performing a traditional japanese dance, after having already told the curious audience about the tale in the song. The two japanese lecturers, Ukiko and Ai, showed traditional japanese games and time seemingly flew by in merryness and joy. The Day of Japanese Culture underwent with great interest in corpus 1 of Shumen University and the guests of the festival could once again come face to face with the ancient tradition as well as the modern culture in the land of the Rising Sun. Courses in japanese language and culture, ogranized by the the Center for international collaboration nand projects for Shumen University and the international cultural exchange association (ICEA), are free and are open to everyone interested. 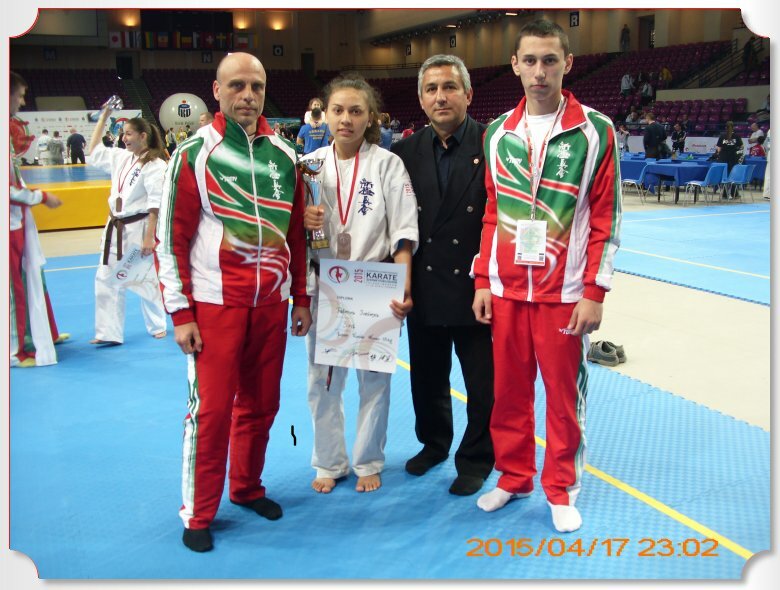 National championships and cadets and children to '12, Shumen 28.03.2015 years. 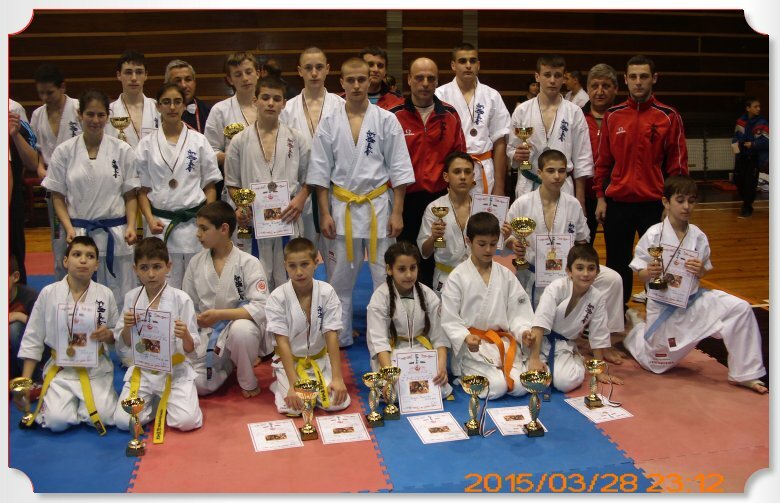 On 28.03.2015 in the "Mladost" hall in Shumen were held the National championships in Shinkyokushin karate for kadets - kumite and kata, and children up to 12 years of age - kumite. The event benefited from the excellent organization by the hosts of SC Kyokushin Shumen and the competition was very strong, bringing in close to 160 people from 21 clubs of the Bulgarian Karate Shinkyokushin Federation from the whole country. The audience witnessed as many close fights were fought, in which the young karatekas showed great technical growth, strong fighting spirit and excellent physical conditioning. An exceptional performance was made by the competitors of SC Kyokushin Shumen, winning 6 gold, 4 silver and 7 bronze medals. 6.Kaan Shukri in kadets, 55kg. SC Kyokushin Shumen did well by hosting the National championships in Shinkyokushin karate for kadets - kumite and kata, and children up to 12 years of age - kumite, thanks to the help of the Municipality of Shumen, "Ultima" ltd, "Agrofresh-A", "ILIEV KOREKT" ltd, VIP CREDIT, Osmar Winery, 3S COT, ICON. The competitors of Shumen's club continue their preparation for the upcoming European competition for juniors, men and women, which will take place on 17 and 18.04.2015 in Warsawa, Poland.